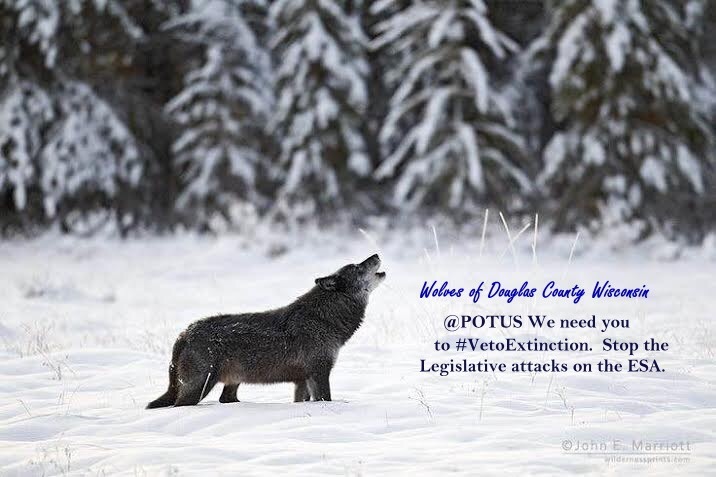 Take Action- There are two anti-wolf bills in the senate. Senator Ron Johnson (R-WI) introduced an amendment that would remove wolves from federal Endangered Species Act protections in four states and no judicial review. This is the second anti-wolf bill to be introduced in the senate. The first is the Bipartisan Sportsmen’s Act. Both of these bills call for delisting wolves in Minnesota, Wisconsin, Michigan and Wyoming. Anti-wolf special interest, trophy hunt clubs backed by big money, have been fighting to delist wolves in these four states ever since a federal judge placed wolves back on the endangered species list on December 19, 2014. It’s time to take action to stop the attacks on the endangered species act. Contact your U.S. members in the senate and ask them to oppose delisting of wolves in Minnesota, Wisconsin, Michigan and Wyoming. Trophy hunting is about power not conservation! Take action to protect our endangered species! Use this easy form, Democracy.io to contact your U.S. representatives in the senate. Wisconsin Voters Support Protecting Wolves by 8 to 1 Margin (2013) and public opinion surveys demonstrate that Minnesotans clearly value their wolves. Michigan voters reject wolf hunting. In Wyoming, the state ordered wolves shot on sight. It was no small wonder that a Judge restores protections to wolves in Wyoming. These four states proved they could not manage an endangered species such as wolves. Take action today to stop extinction! Stop trophy hunts on endangered and threatened species! For more information on how to stop the wolf delisting legislation contact the following organizations. For wolf education, wolf awareness and wolf advocacy go to the following blogs and Facebook sites. Information on anti-wolf and environment legislation go to the following links. Want to let you know I sent out letters to all three senators. It won’t matter with Johnson. Unfortunately, being so tied to agriculture, Kind is not the easiest ear to bend on this topic either, but he is in general, a better listener. I hope Baldwin is our on side with this, but I don’t know her position. PLEASE PLEASE KEEP OUR WOLVES PROTECTED..THIS IS SO VERY IMPORTANT TO KEEP OUR WILDLIFE BALANCED..EXTINCTION IS FOREVER..B.B.. Being from the state of Maine and what little populations of wolves we have , I truly feel that wolves should be kept on the Endangered Species List. They Shouldn’t be removed. If only Congress and the President and the Fish and Wildlife Service would understand that by killing wolves, they’re killing the ecosystem and by killing the ecosystem, this world won’t be the same. Please leave these beautiful animals alone to live! Protect them. Keep them on the Endangered list! !